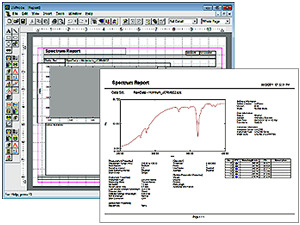 UVProbe is multifunctional, easy-to-use software supplied as standard with Shimadzu UV-VIS Spectrophotometers. When combined with CLASS-Agent, it provides powerful support for Part 11 compatibility. 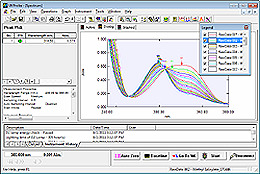 A kinetics (time-course) measurement mode is available in addition to spectral and photometric (quantitative) modes. Comprehensive data-processing functions are provided for each mode. Reports can be created with a free layout of graphs and tables. The thickness and color of graph lines can be changed, and text and diagrams pasted. Finished layouts can be conveniently saved as templates. Offers comprehensive GLP/GMP support functions, includingsecurity functions such as user authentication and authoritysettings, audit-trail functions for original acquired data and dataprocessing history, and instrument log. Connection to the optional CLASS-Agent software offers powerfulsupport for FDA 21 CFR Part 11. 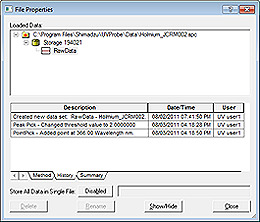 Data acquired using UVProbe andcalculated data can be automatically or manually registered formanagement in a database. When the security functions are enabled, an identificationcode and password are required when logging in. Advancedsettings are available for the password. The functions assignedto each user can be restricted as well. Data is stored in a file inside a directory structure. After calculations and other data processing based on original acquired data, the results are saved by creating new data inside the same file separate from the original data. The history log (user, date, operations) is also maintained inside this file. If a change is made to measurement data, a history of this is added to the data. To use these functions, UVProbe must be installed in Security mode or GLP mode.